On November 19, 2015, the Food & Drug Administration (FDA) became the first government agency in the world to approve a genetically engineered food animal for sale and human consumption. Created by the company AquaBounty, the laboratory construct is known as "AquaAdvantage Salmon." The FDA's action will likely serve as a precedent for the assessment of all future GE food animals and for review of their impacts on the environment. How was the new food animal engineered? By combining DNA from three animals: Atlantic salmon (Salmo salar), deep water ocean eelpout (Macrozoarces americanus) and Pacific Chinook salmon (Oncorhynchus tshawytscha). To manufacture an animal that grows unnaturally fast. The genetic engineering causes overproduction of an insulin-like growth factor hormone. The new animal purportedly grows to commercial size in half the time of conventional Atlantic salmon. These two animals are about the same age. The larger one was genetically engineered to grow at twice the rate of normal Atlantic salmon (foreground). AquaBounty facility in Souris, Prince Edward Island, Canada, July 26, 2007. Are GE salmon in stores now? No. Though the company has not announced its detailed plans for production, it appears likely that these fish will arrive in stores sometime in the next two years. Will GE salmon be labeled in supermarkets? FDA is allowing the company to choose whether or not to include labels. And, the new GE labeling bill S.764, signed into law on July 29, 2016, prohibits states from requiring labels. Consumers may not know if they are buying or eating a GE animal. Where will GE salmon be created? Genetically engineered eggs will be produced on Prince Edward Island, Canada. They will then be sent to an undisclosed site in Panama, where they will be grown to market-size and processed into fillets. The fillets are shipped to the United States, completing a 5,000 mile journey to consumers. AquaBounty has stated that they eventually intend to grow GE salmon within the United States. What’s wrong with GE salmon? Instead of fixing the environmental problems we have created or investing in the protection and recovery of our existing wild salmon resources, investing in genetically engineered salmon brings a host of new threats to imperiled wild salmon—further undermining the sustainability of our food supply. This man-made animal highlights the ways we have devastated many of our wild fish populations and our continuing failure to recover this once-abundant natural food source. Are GE salmon a threat to wild salmon? Yes. The risks are very real and would be irreversible. If GE salmon escape into the environment, they would threaten native species via predation or competition for limited food and space, transgenic contamination, and an increase in exotic diseases and parasites. Once engineered organisms are let loose into the environment, it is impossible to recall or eliminate them. Unlike chemical pollution, GE contamination is a living pollution that can propagate itself over space and time via gene flow. Aren’t GE salmon manufactured to be sterile? GE salmon eggs are treated to be sterile, but these methods are only 95–97% effective. With hundreds of thousands of eggs in production, this inevitable failure rate results in thousands of fertile fish. The adult salmon that have been engineered to fertilize the eggs (broodstock) are not sterile and could mate with native salmon in the wild. Is it likely that GE salmon will escape into the wild? While FDA assumes this won’t happen, numerous independent scientists—and many within the federal fish and wildlife agencies—highlighted that FDA’s analysis of this risk was woefully incomplete. Farmed salmon already routinely escape into the wild, and already exceed wild salmon in some river systems. Especially given AquaBounty plans to expand its sales to farmed salmon facilities in other countries—including the U.S.—it is simply unrealistic to expect that GE salmon will not escape into the wild. What’s the current state of wild salmon? On the east coast, of the New England rivers in which Atlantic salmon runs were historically found, only 16% currently support salmon. The remaining populations are so low that all U.S. Atlantic salmon are listed as endangered. California coastal Chinook salmon, Central Valley spring-run Chinook salmon, Lower Columbia River Chinook salmon, Puget Sound Chinook salmon, Sacramento River winter-run Chinook salmon, Snake River fall-run Chinook salmon, Snake River spring/summer-run Chinook salmon, Upper Columbia River spring-run Chinook salmon, Upper Willamette River Chinook salmon, Columbia River chum salmon, Hood Canal summer run chum salmon, Central California Coast coho salmon, Southern Oregon and Northern Coastal California coho salmon, Lower Columbia River coho, Oregon Coast coho salmon, Snake River sockeye salmon, Central California Coast steelhead, California Central Valley steelhead, Lower Columbia River steelhead, Middle Columbia River steelhead, Northern California steelhead, Snake River Basin steelhead, South-Central California Coast steelhead, Southern California steelhead, Upper Columbia River steelhead, and Upper Willamette River steelhead. The scattered remaining healthy Pacific salmon fisheries—such as those in Bristol Bay, Alaska—constitute some of the best, and most valuable, remaining wild fisheries on earth. 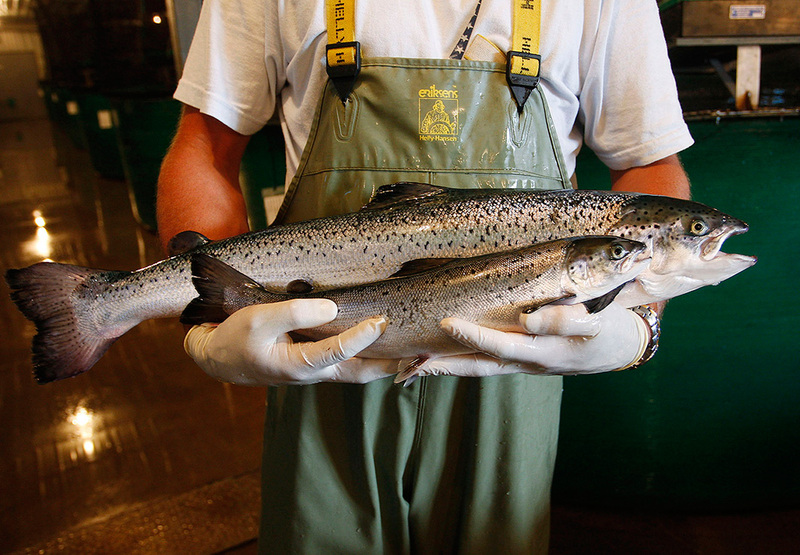 What’s wrong with the way GE salmon was approved for market? 1. FDA does not have the exclusive authority to regulate GE animals. The agency claims it can approve and regulate GE animals as “animal drugs” under The Federal Food, Drug, and Cosmetic Act of 1938. Those provisions were meant to ensure the safety of veterinary drugs administered to treat disease in livestock. Genetically engineered animals are not animal drugs. 2. FDA does not have the expertise.The agency exists to ensure that the food and drugs we consume are safe for humans. It does not typically evaluate the environmental impacts of new types of engineered foods in the ecosystem. The two agencies with actual biological expertise in fisheries and ocean ecosystems, National Marine Fisheries Service and U.S. Fish and Wildlife Service, were not given the chance to formally review FDA’s approval. Who has criticized the approval of GE salmon? The world’s preeminent experts on GE fish, Dr. Anne Kapuscinski and Dr. Frederik Sundström, as well as biologists at the National Marine Fisheries Service and Fish and Wildlife Service. They heavily criticized the FDA decision for significant deficiencies in the science (and scientific approach) the agency took to evaluate environmental risks. 1.8 million members of the public submitted comments in opposition to the approval, due to FDA's failure to analyze and prevent risks to wild salmon and the environment. A coalition of eleven environmental, consumer, and commercial and recreational fishing organizations, jointly represented by legal counsel from Center for Food Safety and Earthjustice, sued the FDA over approval on March 30, 2016. The legal challenge to the FDA's decision to approve GE salmon is working its way through the court system and a decision could come in mid-2017. A new federal labeling law signed July 29, preempts stricter state laws that would have required GE salmon to be labeled. Over the next two years, the Department of Agriculture will be formulating rules governing which foods will be labeled and what those labels must disclose. Sign up for important updates from Earthjustice on this legal challenge and on opportunities to get involved. And, support the earth's legal team with a tax-deductible donation. While it may seem to some couch-loving humans that salmons' lives would be much easier if they just stayed put after being born (rather than journeying all the way out to the ocean and then all the way back again), heading to the open waters has some significant advantages. Namely, the food. There's a lot more of it out there.